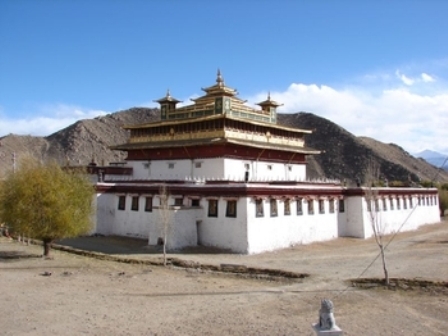 Built in the 8th century, Samye Monastery was the first Buddhist monastery to be founded in Tibet. 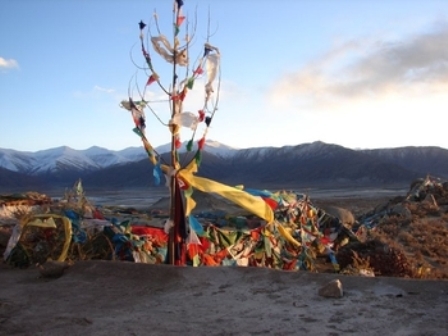 It is also notable as the site of the “Great Debate” (792-794) between the Indian Mahayanists and Chinese Chán (Zen) Buddhists. 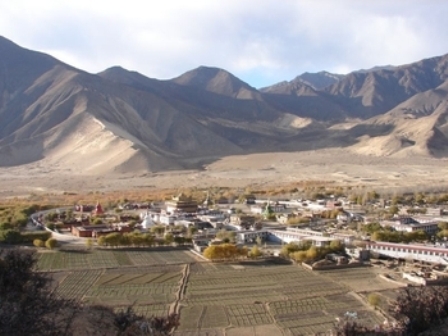 Padmasambhava’s involvement makes Samye important in the Nyingma school, but it was later taken over by the Sakya and Gelugpa schools. 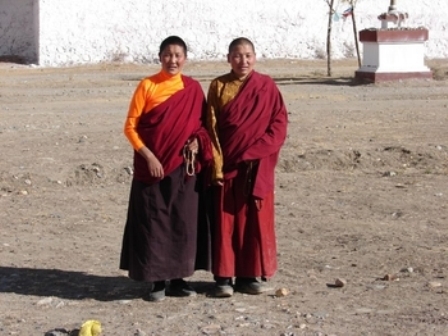 Today, Tibetans of all traditions come to worship here. 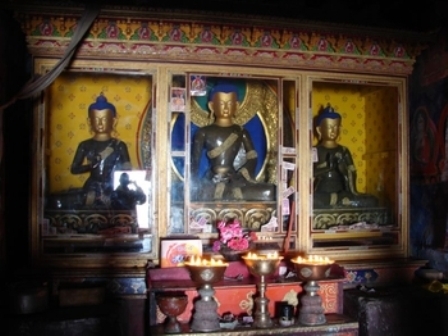 Flanking the entrance to the main chapel are statues of historical figures associated with Samye’s founding: Shantarakshita, Padmasambhava, Trisong Detsen and Songtsen Gampo are among those on the left. 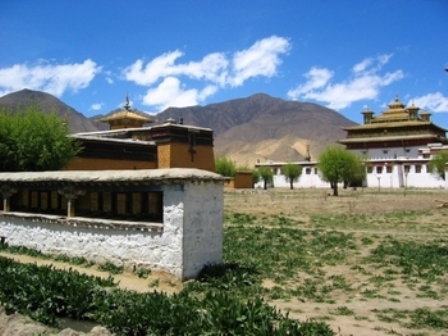 In the bedroom is a barred, glass-fronted case full of wonderful relics: Padmasambhava’s hair and walking stick, a Tara statue that is reputed to speak, and the skull of Shantarakshita. 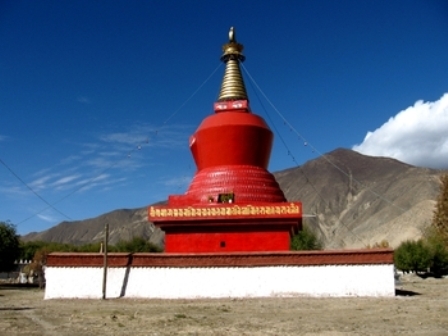 The four brightly-colored chortens (black, white, red and green) at the main temple’s corners are modern and each one is slightly different. Inside them are stairs and tiny chapels. Most visitors either love them or hate them. Note: This information was accurate when published and we do our best to keep it updated, but details such as opening hours can change without notice. To avoid disappointment, please check with the site directly before making a special trip. Last update: 06/18/2009. 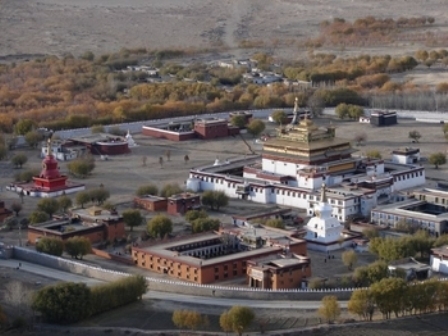 Below is a location map and aerial view of Samye Monastery. Using the buttons on the left, zoom in for a closer look or zoom out to get your bearings. Click and drag the map to move around. For a larger view, see our Tibet Map. Last updated on June 18, 2009. Angkor Wat (“City Temple”) is a vast temple complex near Siem Reap, about 200 miles from the capital of Phnom Penh in Cambodia. Built in the 12th century by the king of the prosperous Khmer empire, Angkor Wat was built as a royal temple dedicated to a Hindu deity. After the city of Angkor fell to invaders, Angkor Wat receded into the jungle but continued as a Buddhist temple and a pilgrimage site over the centuries. Angkor Wat is the best preserved example of Khmer architecture in Cambodia and is so grand in design that some rank it among the seven wonders of the world. It appears on the Cambodian national flag, a very rare instance of a flag incorporating an image of a building. The “lost city” of Angkor first attracted the interest of Europeans in the 1800s after Cambodia was colonized by the French. 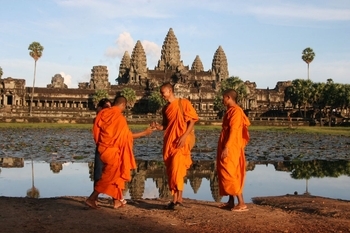 Today, Angkor Wat continues to draw thousands of visitors anxious to see this remarkable ancient temple in the jungle. In addition to many tourists, Buddhist monks are daily visitors to Angkor Wat, their bright orange robes making a vivid contrast with the grey stone of the temple. 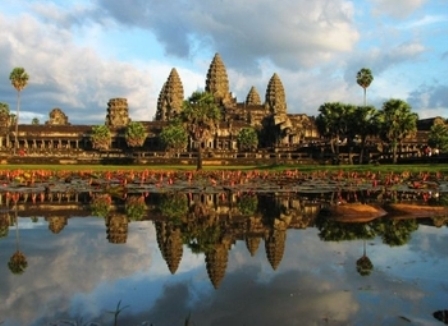 The city of Angkor was the capital of the Khmer Empire from the 9th to the 15th centuries. The Khmer empire was one of the most prosperous and sophisticated kingdoms in the history of Southeast Asia, and its prosperity was expressed through a wide range of architecture. The city of Angkor was founded on political and religious ideas adapted from India, and the temples of Angkor were intended as a place of worship for the king and a way for him to ensure his immortality through identification with the Hindu gods. Angkor Wat was built by King Suryavarman II in the 12th century as a vast funerary temple that would hold his remains, symbolically confirming his permanent identity with Vishnu. Many of the bas-reliefs in the temple depict scenes from the Ramayana and Mahabharata, Hindu sacred texts that recount the adventures of two major incarnations of Vishnu. 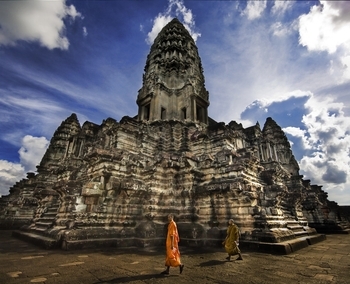 During its six centuries as imperial capital, Angkor went through many changes in architectural styles and in religion. 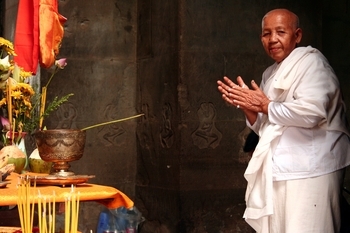 The city of Angkor transferred its from the Hindu god Shiva to the Hindu god Vishnu, and finally to the Mahayana Buddhist deity Avalokitesvara. 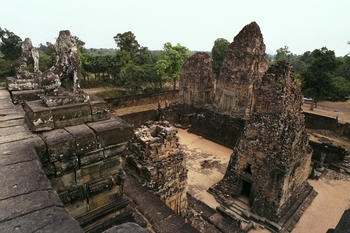 By the late 13th century, the once frenzied pace of Angkor’s architectural pursuits had begun to die down, and a more restrained type of religion was on the rise under the growing influence of Theravada Buddhism. At the same time, Angkor and the Khmer Empire were increasingly threatened and attacked by invading armies. 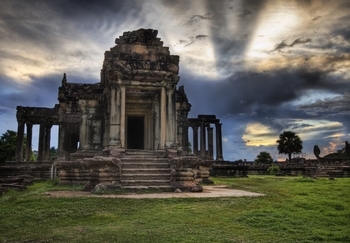 By the 16th century, the golden age of Angkor was over and many of the great temples began to recede into the jungle. From the 15th to 19th centuries, Theravada Buddhist monks cared for Angkor Wat, and it is thanks to them that the temple remains mostly intact. 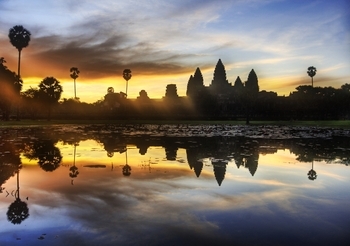 Angkor Wat became one of the most important pilgrimage sites in Southeast Asia. 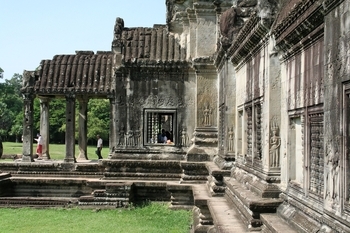 European visitors to Cambodia towards the later end of this period were intrigued by the “lost city” of Angkor. 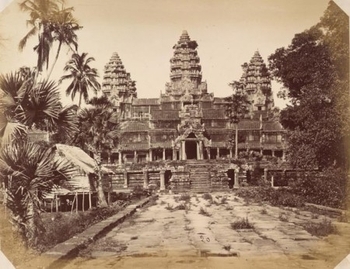 After the French established a colonial regime in Cambodia in 1863, the entire site became a focus of scholarly interest. 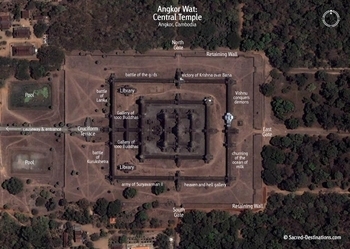 Angkor’s temple architecture was heavily influenced by Indian ideas. From the earliest days of the city, Angkor had been conceived as a symbolic universe structured according to Hindu cosmology. The city was accordingly built around a central temple on a hill, which symbolized Mount Meru, the home of the gods. The central tower of each temple also represented Mount Meru. 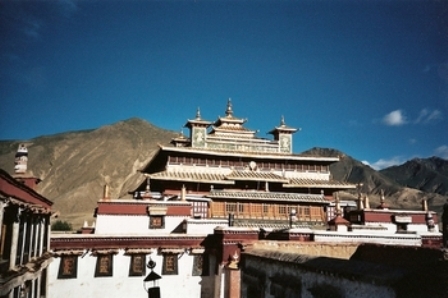 The outer walls of the temple represented the mountains that were believed to encircle the cosmos. The first gallery has square pillars on the outer side and a closed wall on the inner side. The ceiling between the pillars is decorated with lotus rosettes; the closed wall is decorated with dancing figures. The outside of the inner wall is decorated with pillared windows, apsaras (heavenly nymphs), and dancing male figures on prancing animals. 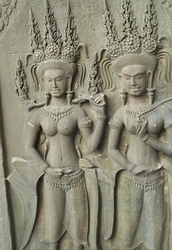 Apsaras are found on the walls of all galleries. The five central shrines have three levels, connected by numerous exterior staircases and decreasing in dimensions as they go up. The temple culminates in the sanctuary, a great central tower pyramidal in form. Towers also surmount the angles of the terraces of the two upper stages. Three galleries with vaulting supported on columns lead from the three western portals to the second stage. They are connected by a transverse gallery, thus forming four square basins. The western exterior forecourt of the main temple contains two “libraries,” or smaller temple structures. 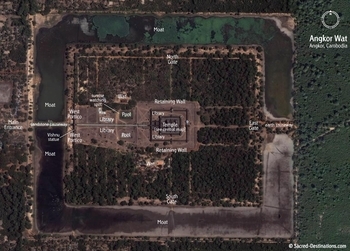 As of 2004, the library on the left was under renovation by a Japanese archeological team.The area surrounding the exterior moat is a lawned park, incongruous in Cambodia. 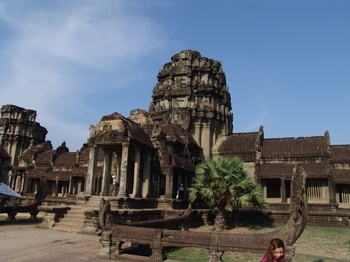 Visitors to Angkor Wat take away varied impressions of these amazing temples. 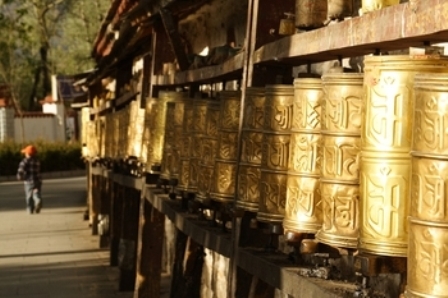 Some gain insight into Buddhism or archaeology, and some relate their experience as connecting with the spiritual energy of the temples. The one common thread, though, is the visitors’ impressions of sunrise and sunset. The sunrise and sunset views from the upper terraces of Angkor Wat itself are some of the best, though it’s a tough climb for some. Ignore half-hearted entreaties by staff to leave after the first clears of the horizon at sunset; stay for the afterglow. It’s a bit crowded, but the views from Phnom Bakeng (Bakeng Hill), just a short drive past the entrance to Angkor Wat, is stunning at both sunrise and sunset. It’s a good little climb up the hill, and those so inclined can go by elephant. The open area on the eastern side of Banteay Kdei looks over one of Angkor’s many reservoirs, this one full and a great reflective pool for the rising glow at sunrise. Note: This information was accurate when published and we do our best to keep it updated, but details such as opening hours can change without notice. To avoid disappointment, please check with the site directly before making a special trip. Last update: 01/19/2010. Last updated on January 19, 2010. CAIRO – Egypt’s antiquities authority announced on Wednesday the discovery of an ancient trading settlement in one of its desert oases dating back more than 3,500 years, a millennium older than previous discoveries in the area. The Yale University mission discovered the settlement while excavating in Kharga Oasis, more than 300 miles (500 kilometers) south of Cairo in the Western Desert. 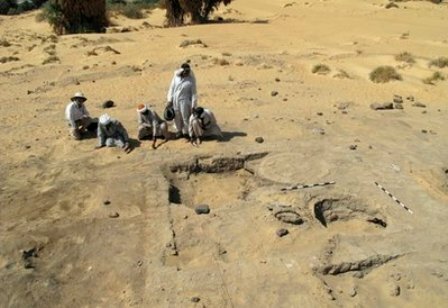 The site is on what was once a bustling trade route between the ancient Egyptian civilization in the Nile valley and the rest of Africa, said the statement from the Supreme Council of Antiquities. Mission head John Darnell said the site had a massive baking operation suggesting it may have been a food production center. The site reached its peak during the latter years of the Middle Kingdom (1786-1665 B.C.). 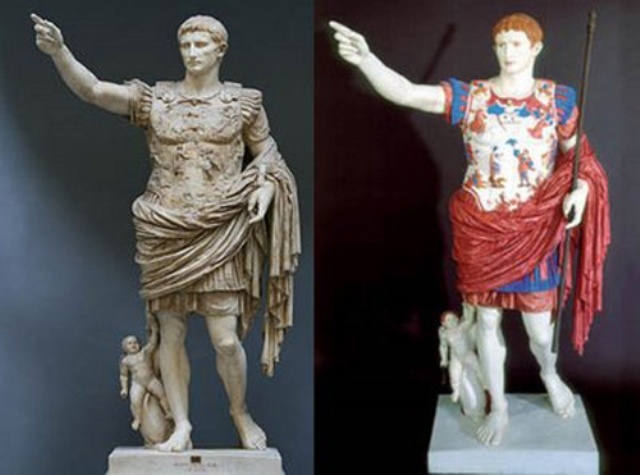 Original Greek statues were brightly painted, but after thousands of years, those paints have worn away. 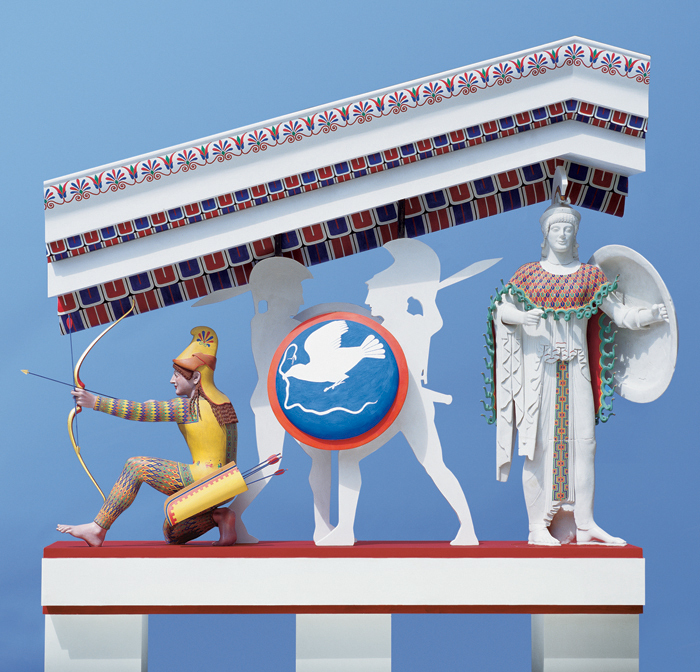 Find out how shining a light on the statues can be all that’s required to see them as they were thousands of years ago. The color? Always something tacky. Via Harvard, Colour Lovers, Tate, The Smithsonian, Colorado University, and Carleton. 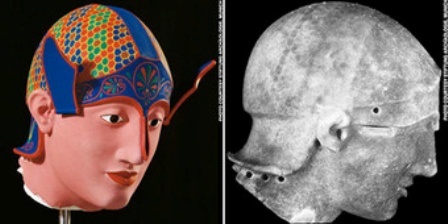 Top two images are reconstructions created by Vinzenz Brinkmann.